The Republican plot against American democracy is not a myth, a slogan, or a theory. It would probably make a very bad movie with an implausible story line. But it’s none of those things. It’s a contemporary Republican policy—and it’s in full operational mode. I’m usually not a conspiracy theorist, but recent actions that are damaging the cornerstones of American democracy have me very worried. Over the past 30 years, we have witnessed—and tolerated—the slow poisoning of America’s democratic institutions, and the pace has accelerated dramatically in the 2016 election cycle. Put all of the pieces together, and you have a relentless and escalating assault on all three branches of our government, plus a significant chunk of the Bill of Rights. We now know that, from day 1 one of Obama administration, Republican Congressional leaders vowed to block anything that Obama proposed—even if it was good for their constituents or for the country at-large. They have blockaded the legislative branch of government. They barely show up for work. It’s as though they’ve been on strike for eight years. Almost no legislation has worked its way through the House and Senate, as would be normally expected. One-third of our system is at a standstill. I don’t remember hearing about that as an option in Civics 101. Republicans in Congress went so far, in 2013, as to completely shut down the entire federal government for 16 days. They’ve threatened to repeat that action again and again, as a way of blackmailing the country into accepting their radical agenda regarding the federal budget, the debt ceiling, defunding Planned Parenthood, etc. Shutting down the federal government is a beyond-belief, extreme measure. It’s an all-out assault on another third of our system—the executive branch. This strategy isn’t new, it’s just being used more radically than ever. For decades, we’ve heard Republicans call for an end to certain regulatory agencies—such as EPA, OSHA, and the NLRB, agencies that restrict corporations from harming their workers. The total shutdown tactic is just anti-regulatory fervor taken to its illogical extreme. And if you ever wanted proof that Republicans are trying to repeal democracy and replace it with something much less democratic, this behavior is it. And now, we have the ultimate assault on the third branch of government—the judiciary. Current tactics go far beyond the now quaint practice of slow-walking approvals of federal judges. We are now at DefCon 1—a total stonewalling of appointments to the Supreme Court. Who would ever have thought that, after the death of a Supreme Court Justice, the Senate would refuse even to hold a hearing on a nominee? Even worse, Republican leaders in the Senate now have vowed to reject anyone nominated to the US Supreme Court by a Democrat. This behavior makes you wonder if Republicans simply want to let the Supreme Court die by attrition, because they don’t like some of its recent decisions. The most recent example came when Presidential candidate Donald Trump made the shocking, unprecedented assertion that he would not necessarily accept the results of the 2016 Presidential election. That statement elicited gasps, even from Republicans, who immediately understood the democracy-destroying effect such a stance would have. American democracy has prided itself, for its 240-year history, on the peaceful transfer of power. When Donald Trump calls the election system “rigged,” and encourages his followers to reject the results, we are in serious trouble. Of course, Trump’s irresponsible statement did not come out of the blue. It merely represents the culmination of many years of Republican propaganda about voter fraud, which have planted seeds of doubt in the minds of many. If our election system loses the trust of the people, we have begun the descent into anarchy. Republican governors and state legislators have been on a voter-suppression rampage. They are using blatantly unfair strategies, such as voter caging, to purge legitimate voters from the rolls. They are making it harder to vote, by demanding unnecessary photo IDs, restricting voting hours and reducing the number of voting locations. 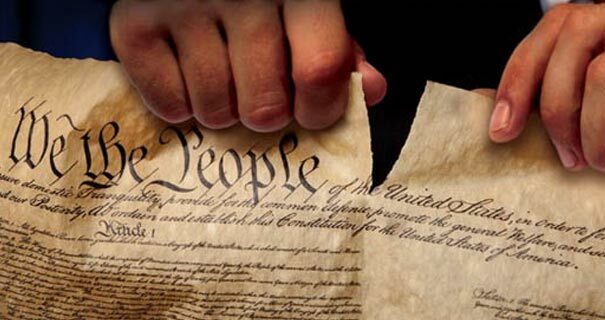 When the constitutionally guaranteed right to vote is limited or even denied by politically motivated actions, one of the essential pillars of American democracy begins to crumble. By the way, it should be noted that these dangerous ideas are not new. Think back a couple of decades to the Reagan years, when budget director David Stockman voiced the “starve-the-beast” philosophy. The idea was to cut taxes, thereby so drastically reducing funding that government agencies would wither, shrink and be so small that one could “drown them in the bathtub.” The cynical corollary, as I understand it, was that when government was inadequately funded, it would become dysfunctional, making citizens see that government just doesn’t work. He and his contemporaries probably were using the term “government” to mean corporate and industrial regulations, as well as spending on the social safety net. Stockman later disavowed his own theory, but it lives on today, in a much more extreme incarnation. I’m not a constitutional scholar, but even I can see that, taken together, these positions and actions add up to something very nefarious. They paint a really scary and bleak picture for the future of American democracy—if we let radical Republicans remain in control.